owning the patent of the technology of intelligent voltage adjusting, can output voltage and current on different levels. 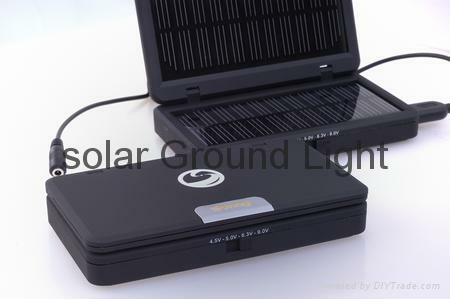 It can charge up most brands mobile phones or USB interface digital products under sunshine directly and also can charge up the devices mentioned above without sunshine through releasing electric energy stored in it. It is convenient for you to take with when you are out on business, on travel, on a long-distance bus or ship, in the fieldwork, etc. It is a portable, environmental-friendly, lightweight, flexible, durable and versatile charging product. Intelligent LED display: 3 colored indicators (red, orange, green) for status of remaining power while charging. It is suitable for most brands cell phone and electronic digital mobile equipment whose charging voltage ranges from 4.5V to 9V. 9V: portable DVD, DV, digital camera of 7.5~9V and etc. Note: The above voltage value is just for reference. As for the detailed voltage, it depends on charging voltage of each product. 5V is better for NOKIA cell phone.